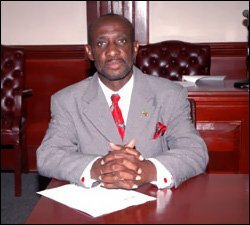 St. Kitts and Nevisâ€™ Minister of National Security, Deputy Prime Minister, Hon. Sam Condor will join Regional Security Systems – RSS – Council of Ministers at a meeting in St. Lucia on Friday, March 25, 2011. The Council of Ministers is the supreme policy making body of the Regional Security System (RSS) and comprises Ministers of Defence and Security in the member states of Antigua and Barbuda, Barbados, Dominica, Grenada, Saint Kitts and Nevis, Saint Lucia and Saint Vincent and the Grenadines. St. Lucia’s Minister for Home Affairs and National Security, the Hon. Guy Mayers assumed the chairmanship of the RSS in 2010. He said that the annual meeting is held in which the RSS reports on its operations for the year and at which the budget for the RSS is confirmed. The Regional Security System (RSS) is an international agreement for the defence and security of the Eastern Caribbean region. The Regional Security System was created out of a need for collective response to security threats, impacting on the stability of the region in the late 1970s and early 1980s.